Today’s Friday sermon was based on writings and observations of Hazrat Musleh Maud (may Allah be pleased with him) illustrating the blessed life of the Promised Messiah (on whom be peace). Hazrat Musleh Maud (may Allah be pleased with him) writes that in early 1908 Hafiz Ahmad Sahib sought marriage proposals for his two daughter Zainab and Kalsoom. There were two proposalss for Zainab and the Promised Messiah (on whom be peace) did not like the proposal from a Misri Sahib but as was his way he did not emphasise on the matter too much. It is during these days the Promised Messiah (on whom be peace) received the revelation: Do not kill Zainab. Hafiz Sahib understood this revelation to mean that he should get his daughter married to Misri Sahib assuming the revelation had overridden earlier advice of the Promised Messiah. He had his daughter married to Misri Sahib. The revelation is dated 9 February whereas his daughter’s nikah took place on 19 February. The date of the nikah was chronicled as it took place with a couple of other nikahs including that of Hazrat Nawab Mubaraka Begum Sahiba. God had clearly forewarned about Zainab’s marriage, inferring that there would be trouble, but her father presumed it to mean the opposite. Proof exists that the Promised Messiah (on whom be peace) advised against this marriage because when Misri Sahib separated from the Jama’at someone said that the Promised Messiah (on whom be peace) had indeed advised against this marriage to him. The narrator said he did not like it when the marriage went ahead and submitted to the Promised Messiah that he was commissioned by God and God commands to listen to those commissioned by him but Hafiz Sahib had not done so. The Promised Messiah (on whom be peace) replied that this was indeed so, but added that he did not interfere in such matters. Hazrat Musleh Maud (may Allah be pleased with him) writes that although he had no doubt about this tradition when it came before him but he thought of seeking a concreate proof. The very next day he received a letter in the post in which someone had written that when he was in Qadian he learned the Holy Qur’an from Hafiz Ahmad Sahib who once told him that the Promised Messiah (on whom be peace) had asked him to marry his daughter elsewhere but he misunderstood his revelation and thought his earlier advice was not correct and married his daughter to Misri Sahib. He said Misri Sahib was very harsh with his daughter and he felt it was a consequence of him not abiding by what the Promised Messiah (on whom be peace) had said. Hazrat Musleh Maud (may Allah be pleased with him) writes that he remembers Misri Sahib beating up his father-in-law in the middle of town following which Hazrat Khalifatul Masih I (may Allah be pleased with him) was very displeased with him and Hazrat Musleh Maud had pleaded with him to forgive Misri Sahib. Sheikh Abdul Rahman Misri Sahib is part of history of the Jama’at. He was an educated man who took bai’at in the lifetime of the Promised Messiah (on whom be peace). The Promised Messiah (on whom be peace) and Hazrat Zafrulla Khan Sahib sponsored him to go to Egypt. It was owing to his trip to Egypt that he was given the title of ‘Misri’ (Misr being the Arabic name for Egypt). A time came that he highly opposed Hazrat Musleh Maud and said much against him and tried to create discord in the Jama’at. God protected the Jama’at against his ploys and some people were shown dreams exposing his ploys. He had so much respect and standing in the Jama’at that when he left someone wrote to Hazrat Musleh Maud (may Allah be pleased with him) from Africa that Misri Sahib’s separation from the Jama’at was highly worrisome because if such important and significant people lost their faith what was to be said of the faith of ordinary people like the letter-writer. Hazrat Musleh Maud wrote back saying it was for God to decide who was important and significant and not for the latter-writer, adding that God had made Misri Sahib lose his way which proved that the letter-writer was important and significant and not Misri Sahib. After his disagreement and leaving the Jama’at Misri Sahib tried to show his importance by associating himself with the revelation but after Hazrat Musleh Maud exposed the reality behind it all, he complained why was his wife dragged into it all. Hazrat Musleh Maud (may Allah be pleased with him) remarked at the tremendous prophecy ‘Do not kill Zainab’ and said Misri Sahib himself drew attention to it at the latter stage. He said this was like Arabs cite a story about a man who took out a knife to slaughter a goat but then forgot about it. In their play his children someone push the knife in the dust on the ground. While he looked for the ‘lost’ knife the goat dragged its feet on the dust and exposed the knife. When someone causes their own ruination Arabs say he has exposed the knife like the goat did. Had he abided by what the Promised Messiah (on whom be peace) advised him his faith would not have been wasted. Believers should listen to those sent by God. Maulawi Muhammad Ahsan Sahib had a hasty nature. Once out for a walk with the Promised Messiah (on whom be peace) he misheard the Promised Messiah (on whom be peace) when he said there is a difference between word of God and word of man and said this is a revelation of mine compared to revelation of Hariri (an academic). Ahsan Sahib remarked how frivolous it was but as soon as he realised his mistake he instantly said what fine words they were. Hazrat Musleh Maud (may Allah be pleased with him) said that a Sikh came to see him and spoke about Hazrat Musleh Maud’s elders. He said his father had asked the father of the Promised Messiah (on whom be peace) about his ‘other son’ and his father had replied that he spent all his time in the mosque reading the Qur’an. He said he worried about his livelihood and suggested to his acquaintance to talk to his son. He said he wanted his son to get an employment but he refused. When the person spoke to the Promised Messiah (on whom be peace) he replied his father worried unnecessarily. He told him to tell his father that he was employed to Whom he wished to and he was not interested to be employed by men. This affected the person who much that he welled up each time he narrated this. Once he sobbed bitterly because he had gone to the graveside of the Promised Messiah (on whom be peace) and out of devotion wanted to prostrate before it but the Ahmadi attendant stopped him and this aggrieved him as he said it was OK for him to prostrate at the grave in accordance with his religion. Maulawi Muhammad Hussain Batalwi used to be a friend of the Promised Messiah (on whom be peace) who said after the Promised Messiah’s claim that it was him who had brought him to prominence and he was now going to cause his decline. However, God erased his name and spread the name of the Promised Messiah (on whom be peace). Hazrat Musleh Maud (may Allah be pleased with him) said a son of Maulawi Muhammad Hussain had turned Hindu whom Hazrat Musleh Maud contacted and had him revert to Islam. Maulawi Muhammad Hussain wrote a letter of thanks to Hazrat Musleh Maud (may Allah be pleased with him). Hazrat Musleh Maud said that opposition of Jama’at has been going on since the time of the Promised Messiah (on whom be peace) but the Jama’at continues to advance. The Jama’at has traversed a very thorny path to reach success and this tells us that God’s grace has been with it. In order to make this grace everlasting the Jama’at should be ever engaged in prayers. God blessed Hazrat Maulana Nur ud Din, Khalifatul Masih I (may Allah be pleased with him) with high ranking employment. Later he successfully practiced in his hometown where he had many aficionados. When he came to Qadian to see the Promised Messiah (on whom be peace) and decided to return home the Promised Messiah told him that he had seen plenty of the world and should now stay at Qadian. He followed this to the letter and simply did not leave and had his belongings sent over from his hometown. He did not have much prospect of practising in Qadian, but he did not care about this. Another companion of the Promised Messiah (on whom be peace) Maulawi Abdul Karim Sahib had an ardent love for the Promised Messiah which only those can appreciate who were around at the time. Hazrat Musleh Maud (may Allah be pleased with him) said that Maulawi Sahib passed away when he was sixteen or seventeen but he had appreciated his ardent love for the Promised Messiah (on whom be peace) as a child of twelve or thirteen which left a deep mark on him. He could not forget two aspects of his personality; the way he drank water thanking God and his love for the Promised Messiah. The water of the well of Aqsa Mosque was very popular in those days and he would tell people to fetch him some water and earn spiritual reward. When he was in the company of the Promised Messiah (on whom be peace) it appeared as if his eyes consumed something from the physique of the Promised Messiah. Maulawi Sahib’s entire being would be an image of delight at beholding the Promised Messiah and he enthused over everything he said paying tribute to him. It was the Promised Messiah’s (on whom be peace) practice that he held an assembly after Maghrib Prayer. He stopped this routine after the death of Maulawi Sahib and when asked explained that it pained him to see Maulawi Sahib’s empty spot. Once someone made some unfair remarks about Maulawi Abdul Karim Sahib in Qadian and people started beating him up, but the man was quite obstinate and he kept repeating his words. The quarrel grew. Hazrat Musleh Maud says he was a child at the time, and for children this became a spectacle. A non-Ahmadi wrestler used to come to Hazrat Khalifatul Masih I (may Allah be pleased with him) for treatment, he foolishly thought it was meritorious to join the fray and thrashed the man about. But the man continued to say he would say what he wanted to say. The Promised Messiah (on whom be peace) was most displeased when he came of know of this incidence and said that this was against our teaching. He said people were abusive to us but it did not harm us in any way, so what if the man said a few words! Another companion of the Promised Messiah (on whom be peace) Munshi Roora Khan Sahib was also ardently devoted to the Promised Messiah (on whom be peace). He was from Kapoorthala. The Promised Messiah highly praised Kapoorthala Ahmadis for their sincerity and said that they showed so much sincerity that they would be with him in Paradise. Once the Promised Messiah (on whom be peace) arrived at Kapoorthala unannounced. When he alighted at the train station an intense opponent saw him. Awed by his presence he ran to where Roora Sahib was and told him his Mirza Sahib had come. Hearing this Roora Sahib also rushed towards the station without any head gear on, a requisite for those times. After rushing for some distance he stopped and wondered if this was true at all, if the opponent had jested and if they could be so lucky in Kapoorthala to be graced by the Promised Messiah’s presence. He told the man off for telling lies, but then changed his mind again and started walking to the station. He covered the distance stopping and starting off not quite believing his luck until he saw the Promised Messiah (on whom be peace) walking towards him. Such was his ardent and passionate love. After the passing away of the Promised Messiah (on whom be peace) Roora Sahib came to Qadian and gave a few gold coins to Hazrat Musleh Maud (may Allah be pleased with him) and told him to give them to his blessed mother. He then started sobbing bitterly. At first Hazrat Musleh Maud thought his sobbing was due to missing the Promised Messiah. However, he cried for almost half an hour during which Hazrat Musleh Maud kept asking him what the matter was but due to being overcome by emotion he could not answer! Eventually he explained how since his time of bai’at he scrimped and saved to offer something to the Promised Messiah (on whom be peace) and how when he earned more he desired to give more and wished to offer gold. But each time he saved up a good amount he felt restless to see the Promised Messiah (on whom be peace) and offered him whatever he had saved and thus never got round to saving enough to offer gold. By the time he have saved enough for the three gold pieces, the Promised Messiah (on whom be peace) passed away and thus he spent 30 years longing to offer gold to him could not do so as he passed away! Hazrat Musleh Maud (may Allah be pleased with him) said that some Arabic letters can only be pronounced correctly by Arabs. Once an Arab came to an assembly of the Promised Messiah (on whom be peace) who did Tabligh to him and quoted from the Holy Qur’an pronouncing certain words/letters in a non-Arabic accent. The Arab remarked that the Promised Messiah assumed to be a Prophet, but he did not even know how to pronounce the words how he could present its commentary! Companion of the Promised Messiah raised their hand to hit the man but the Promised Messiah grabbed his hand and stopped him. He explained that these people only have this as their weaponry how could they not use it! The Promised Messiah (on whom be peace) also said that honesty and proper arguments should not be expected of them or else there would have been no need for his advent. He said his advent demonstrated that these people had no real arsenal. Hazrat Musleh Maud (may Allah be pleased with him) said that when the Arabs themselves maintain that no one can pronounce the letters ق and ض like them, then why are they critical when someone ‘mispronounces’ them? Huzoor explained that these accounts are both about the letters ق and ض and he was explaining this so that people do not write it to say the accounts they know are about the letter ض causing Huzoor’s post to needlessly increase. Huzoor said the team which deals with post already worries about the bulk of the post received! Hazrat Musleh Maud (may Allah be pleased with him) said that enemies wrote extremely filthy letters to the Promised Messiah (on whom be peace) and reading them made one’s blood boil but the Promised Messiah was most patient in response. Hazrat Musleh Maud said these letters arrived in large numbers, perhaps two or three a week, while he received perhaps four or five such letters a year. These letters were foul and full of abuse. Once Hazrat Musleh Maud happened to read some of these letters which made his blood boil. When the Promised Messiah saw him reading the letters he took away the bag carrying the letters and said he should not read them. The Promised Messiah used to keep these letters in bags and these bags would be put away in a wooden chest. He often burnt them but soon more collected. It is about these bags that the Promised Messiah wrote I have bags full of abuse of enemies. These letters did not just contain abuse but had false accusations and wicked allegations. It is foolish to be perturbed by such things, they happen to straighten our righteousness. There is no need to be angry and get carried away. After all a vessel will only brim over with what it contains and only foulness will be evident from the enemy’s heart. It is for us to keep our morals and civility in check. Hazrat Musleh Maud (may Allah be pleased with him) said that it is written in the newspaper Badr as well as he remembered it well that on one of his visits to Delhi the Promised Messiah (on whom be peace) went to the shrines of various saints for prayer. These saints were: Khawaja Baqi Billa Sahib, Hazrat Qutb Sahib, Khawaja Nizam ud Din Sahib Aulia, Shah Wali Ullah Sahib, Hazrat Khawaja Mir Dard Sahib and Naseer ud Din Sahib Chiragh. Although it is not recorded in the diary of the time but what Hazrat Musleh Maud remembered well was that the Promised Messiah (on whom be peace) prayed: the hearts of people of Delhi have died. We wanted to go to the graves of the deceased saints to pray for them, for their progeny and also for the people of Delhi so that the spirits of these saints would be enthused to pray for their guidance. Hazrat Musleh Maud said the account recorded in the diary is only this much that the Promised Messiah (on whom be peace) prayed at the shrines of the saints for them, for himself and for a few other matters. In his book The Narrative of Two Martyrdoms (Tadkiratush Shahadatain) the Promised Messiah (on whom be peace) says: ‘When I began to write this book, it was my intention to complete it and take it with me to Gurdaspur… But it so happened that I suffered a severe attack of pain in my kidney and I apprehended that my design would remain unfulfilled as the time was running short… God Almighty then directed my attention to prayer. It was three in the early morning and I told my wife that I was going to pray to Allah and she should say ‘Amen’ after me. In that terrible state and bearing in mind Sahibzada Abdul Latif I began to implore God and supplicated that I had desired to write this booklet in his memory…I was completely cured before six o’clock in the morning and I finished writing half the book that very day.’ He wrote this account under the heading: A New Miracle of the late Maulawi Abdul Latif Sahib. It is proven that the Holy Prophet (peace and blessings of Allah be on him) himself prayed many times in this manner. What is forbidden is to assume about a deceased person that he can give us something. This is wrong and Islam deems it haram. Other than this going to such locations and praying generates tenderness and humility in heart or praying by remembering the promises God made to His Prophets and supplicating to have those promises fulfilled in our persons is a spiritual reality and it is obligatory on true believers to seek such blessed locations to avail of them. For example we can pray to God at the tomb of the Promised Messiah (on whom be peace) that this is the person with whom was Your promise to revive the faith of Islam. It was Your promise to take his name to the ends of the earth. Enable us to be part of that promise and fulfil our responsibilities for the completion of his mission. May God enable us to experience the true illustration of Islam for ourselves and also to show it to the world! Funeral Prayer in absentia was announced for Maulawi Muhammad Yusuf Sahib, dervish of Qadian who passed away on 22 July at the age of 94. 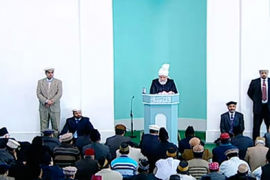 Huzoor read out a brief tribute to him.